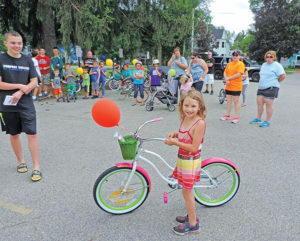 At least 20 bikes were given away at the Blessing of the Bicycles at The Springs Church last Saturday. Photo by Duane Harriman. The 3rd annual Blessing of the Bicycles was held at The Springs Church in Cedar Springs last Saturday, June 24. The focus of the event is to make sure kids get connected with a bike if they don’t have one. Each year organizer Johna Alexander takes donations of used bicycles and has them refurbished, and they also give away some new ones at the event. Simple repairs and maintenance is offered to kids who already have a bike. The Kent County Sheriff Department and many other volunteers helped make the Blessing of the Bicycles a success. Photo by Duane Harriman. 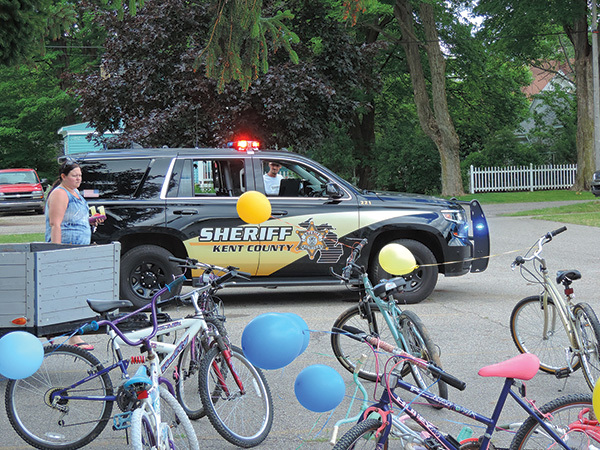 The Kent County Sheriff Department was on hand, to talk about bicycle safety, and worship Pastor Greig Hess gave the blessing over the bicycles. Alexander said that she was grateful for the bicycle donations and for all those that participated. “Seeing all the smiling faces on the children in our community is a blessing for all that took the time to come and help,” she said. If anyone has a bicycle they would like to donate for next year’s event, please call 616-799-2850 for a drop off or to be picked up.